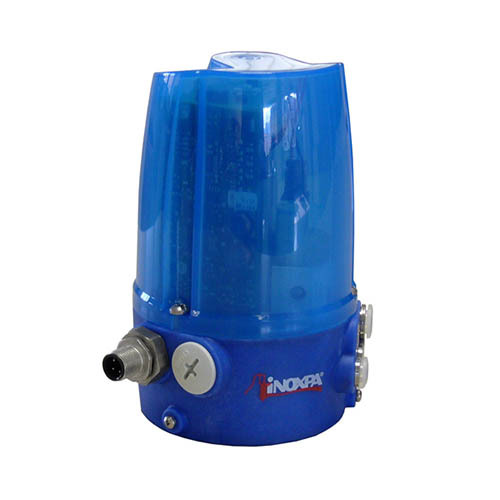 The C-TOP+ control unit with AS-i (Actuator Sensor Interface) communication is designed or intended for the optimal automation of INOXPA process valves. 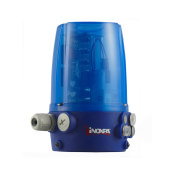 This option is available for the entire range of valves supplied with C-TOP+ units (ball valve, butterfly valve, single and double seat multiway valve, etc.). 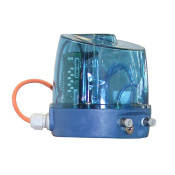 The AS-i interface is a field bus system that allows connecting a network of actuators and sensors (detectors) to a higher level control device (master). A power supply, one or several master (or control) modules, bus cable (preformed cable), an IDC connector, an IDC connector to C-TOP+ connector connection cable, and the C-TOP+ prepared for AS-i (special card for AS-i with connector). The AS-i field bus obtains the required voltage from a power supply. The sensors and solenoid valves connected to the field bus are controlled by the master module. Every master sends the information to the PLC and is able to control up to 62 slave units (62 C-TOP+ AS-i units). The interconnection is made with a preformed cable. The preformed cable is used both for the transmission of information and as a power supply for the solenoid valves and detectors. The C-TOP AS-i head must always be used in conjunction with magnetoresistive detectors. 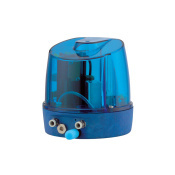 The C-TOP+ AS-i also incorporates three signalling LEDs which continuously indicate the status of the valve, and one flashing red LED to alert in case of signal loss. The C-TOP+ AS-i is characterised by its modular simple and robust design which guarantees maximum flexibility during installation. 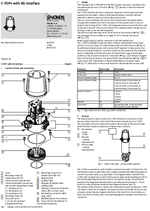 Due to its enormously reduced wiring requirements, it facilitates the installation and commissioning of the system. Moreover, it reduces the commissioning time and potential installation errors. Depending on the version, the head can have up to three solenoid valves 3/2 (NC) and three sensors. If necessary, an additional external sensor can be connected. The sensors are magnetoresistive, with contactless activation by means of a magnet connected to the control shaft. The C-TOP+ AS-i heads are configured according to each customer's requirements. Summary El C-TOP+ con comunicación AS-i (Actuator Sensor Interface) está diseñado o pensado para una automatización óptima de las válvulas de proceso de INOXPA. 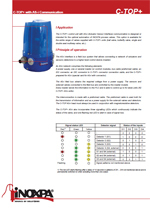 Summary The C-TOP+ control unit with AS-i (Actuator Sensor Interface) communication is designed or intended for the optimal automation of INOXPA process valves. Summary Le C-TOP+ avec bus AS-i (Actuator Sensor Interface) est conçu ou pensé pour optimiser l'automatisation des vannes de process d'INOXPA. Summary Контрольное устройство C-TOP+ с коммуникацией AS-i (Actuator Sensor Interface) разработано для оптимальной автоматизации поточных клапанов от INOXPA. Summary Il C-TOP+ con comunicazione AS-i (Actuator Sensor Interface) è progettato per una automazione ottimale delle valvole di processo INOXPA.